The broadly accepted theory for the origin and evolution of our universe is the Big Bang model, which states that the universe began as an incredibly hot, dense point roughly 13.7 billion years ago. So, how did the universe go from being fractions of an inch (a few millimeters) across to what it is today? Here is a breakdown of the Big Bang to now in 10 easy-to-understand steps. It took quite a bit more than seven days to create the universe as we know it today. SPACE.com looks at the mysteries of the heavens in our eight-part series: The History & Future of the Cosmos. This is Part 3 in that series. The Big Bang was not an explosion in space, as the theory's name might suggest. Instead, it was the appearance of space everywhere in the universe, researchers have said. According to the Big Bang theory, the universe was born as a very hot, very dense, single point in space. A key part of this comes from observations of the cosmic microwave background, which contains the afterglow of light and radiation left over from the Big Bang. This relic of the Big Bang pervades the universe and is visible to microwave detectors, which allows scientists to piece together clues of the early universe. In 2001, NASA launched the Wilkinson Microwave Anisotropy Probe (WMAP) mission to study the conditions as they existed in the early universe by measuring radiation from the cosmic microwave background. Among other discoveries, WMAP was able to determine the age of the universe — about 13.7 billion years old. When the universe was very young — something like a hundredth of a billionth of a trillionth of a trillionth of a second (whew!) — it underwent an incredible growth spurt. During this burst of expansion, which is known as inflation, the universe grew exponentially and doubled in size at least 90 times. After inflation, the universe continued to grow, but at a slower rate. As space expanded, the universe cooled and matter formed. 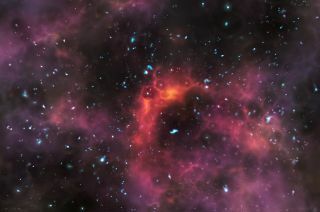 Light chemical elements were created within the first three minutes of the universe's formation. As the universe expanded, temperatures cooled and protons and neutrons collided to make deuterium, which is an isotope of hydrogen. Much of this deuterium combined to make helium. For the first 380,000 years after the Big Bang, however, the intense heat from the universe's creation made it essentially too hot for light to shine. Atoms crashed together with enough force to break up into a dense, opaque plasma of protons, neutrons and electrons that scattered light like fog. About 380,000 years after the Big Bang, matter cooled enough for electrons to combine with nuclei to form neutral atoms. This phase is known as "recombination," and the absorption of free electrons caused the universe to become transparent. The light that was unleashed at this time is detectable today in the form of radiation from the cosmic microwave background. Roughly 400 million years after the Big Bang, the universe began to come out of its dark ages. This period in the universe's evolution is called the age of re-ionization. During this time, clumps of gas collapsed enough to form the very first stars and galaxies. The emitted ultraviolet light from these energetic events cleared out and destroyed most of the surrounding neutral hydrogen gas. The process of re-ionization, plus the clearing of foggy hydrogen gas, caused the universe to become transparent to ultraviolet light for the first time. Data from older missions like WMAP and the Cosmic Background Explorer (COBE), which launched in 1989, and missions still in operation, like the Hubble Space Telescope, which launched in 1990, all help scientists try to solve the most enduring mysteries and answer the most debated questions in cosmology. Our solar system is estimated to have been born a little after 9 billion years after the Big Bang, making it about 4.6 billion years old. According to current estimates, the sun is one of more than 100 billion stars in our Milky Way galaxy alone, and orbits roughly 25,000 light-years from the galactic core. In the 1960s and 1970s, astronomers began thinking that there might be more mass in the universe than what is visible. Vera Rubin, an astronomer at the Carnegie Institution of Washington, observed the speeds of stars at various locations in galaxies. This mysterious and invisible mass became known as dark matter. Dark matter is inferred because of the gravitational pull it exerts on regular matter. One hypothesis states the mysterious stuff could be formed by exotic particles that don't interact with light or regular matter, which is why it has been so difficult to detect. Dark matter is thought to make up 23 percent of the universe. In comparison, only 4 percent of the universe is composed of regular matter, which encompasses stars, planets and people. In the 1920s, astronomer Edwin Hubble made a revolutionary discovery about the universe. Using a newly constructed telescope at the Mount Wilson Observatory in Los Angeles, Hubble observed that the universe is not static, but rather is expanding. Dark energy is thought to be the strange force that is pulling the cosmos apart at ever-increasing speeds, but it remains undetected and shrouded in mystery. The existence of this elusive energy, which is thought to make up 73 percent of the universe, is one of the most hotly debated topics in cosmology. While much has been discovered about the creation and evolution of the universe, there are enduring questions that remain unanswered. Dark matter and dark energy remain two of the biggest mysteries, but cosmologists continue to probe the universe in hopes of better understanding how it all began.